Scott Weidensaul, one of my favorite authors, wrote a magnificent article entitled “Beyond Measure” in the Mach-April issue of Audubon Magazine. In it he artfully and convincingly makes the case for birds. I call it a “just because” plea. We should all love birds, “just because”. Many of us can recall the exact location of a certain sighting, the way our hearts pounded with the first glimpse of the impossibly garish palette of colors that make a Painted Bunting such a brilliant thing. Perhaps it’s the disbelief at the power of a stooping peregrine streaking across a cloud strewn skyscape like a feathered meteor. Maybe some bird is connected with a particular poignant memory--like the flock of rusty and red-winged blackbirds that descended into a copse of bare-boned trees that cold, winter day we buried my father-in-law after his brave bout with cancer. Their coming that sad day and "peppering" the drab scene will be something I always link with that species. Whatever the place or people we're with, our hearts, minds-- and souls-- are better because of birds. 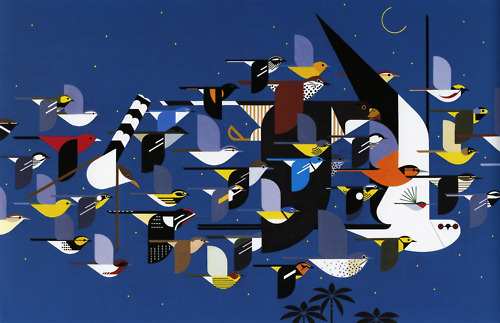 Charley Harper, the Ohio artist who painted nature, especially birds, in a unique minimalist geometrical style that left no doubt as to the species identity and also its “birdinality”, has inspired me just as Scott’s words have. One Harper Painting in particular, “Mystery of the Missing Migrants” sends my mind into wondering wandering fits! Harper’s portrait of a night sky full of migrating birds has intrigued me since I first saw it in Dr. Sidney Gauthreaux’s office when I was a graduate student. Sid, my adviser and the “Father” of radar ornithology helped us understand the plight of trans-gulf migration by many of our favorite species. This time of year, it is a miraculous thing to imagine the sky above us while we sleep, full of feathered things finding their way by star, being pulled my the North Pole across habitats both hospitable and hostile. And so in honor of Scott Weidensaul’s wonderful writing and Charley Harper’s passionate painting. I offer my monthly musing. Lovely post. I really like the poetry and the geometric bird art. Love love, LOVE this! Love the thoughts, the artwork and the poetry! Well done, Oh! WELL DONE!